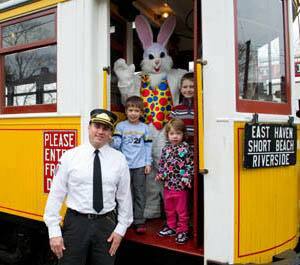 The Easter Bunny will be hopping along to the Shore Line Trolley Museum in April! The event runs 11AM- 4PM on April 13, 14, 19 & 20. Admission is $10.00 with children under 2 years free. No reservations or advance tickets necessary. Take a trolley ride to visit the Easter Bunny, enjoy children’s crafts, coloring, face painting, and more! And each child will receive a small gift from our special guest, too! All included in the price of admission. Bring the family out for some spring fun!